The Via Augusta is an excuse for walking, for pedalling. Whether walking or pedalling, it’s an opportunity to get a look the landscape. Seeing the landscape of the Penedès is a way to discover the region. Discovering the region means understanding the mark of the past, its cultural heritage, and the transformations it has undergone. Where we come from, where we have come to. What is the Via Augusta Penedès? Legionnaires, traders, peasants, civil servants, townspeople... over the years, all of them have followed the 1500 km of this ancient route, which ran from Cadiz to the Pyrenees, linking the peninsula with the capital of the empire, the powerful city of Rome. It was one of the networks of roads—80,000 km of them--- that crisscrossed the empire, from the Sahara to Asia. 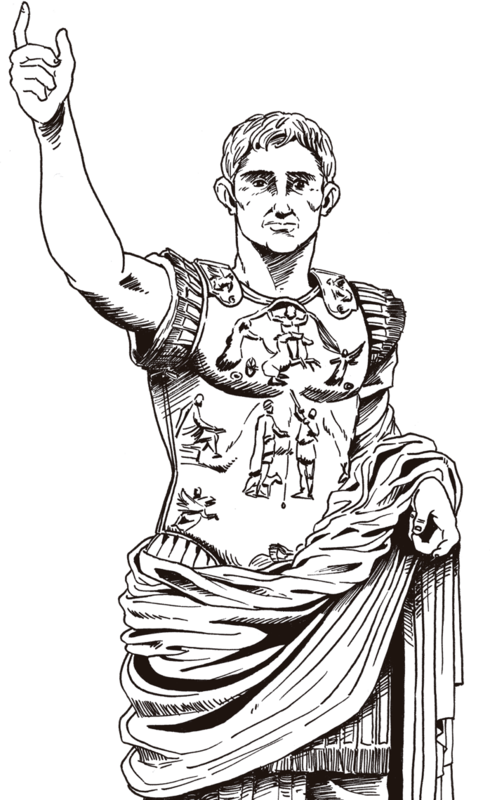 Known before the rise of Rome as the Via Heraclea, the course of the Via Augusta followed that of an old Iberian path, which Roman soldiers made into a road in the 2nd century BCE. Whether on foot, in litters, on animals, or in carts, between one city and another, travellers found inns and stops to feed their horses and repair their carts. 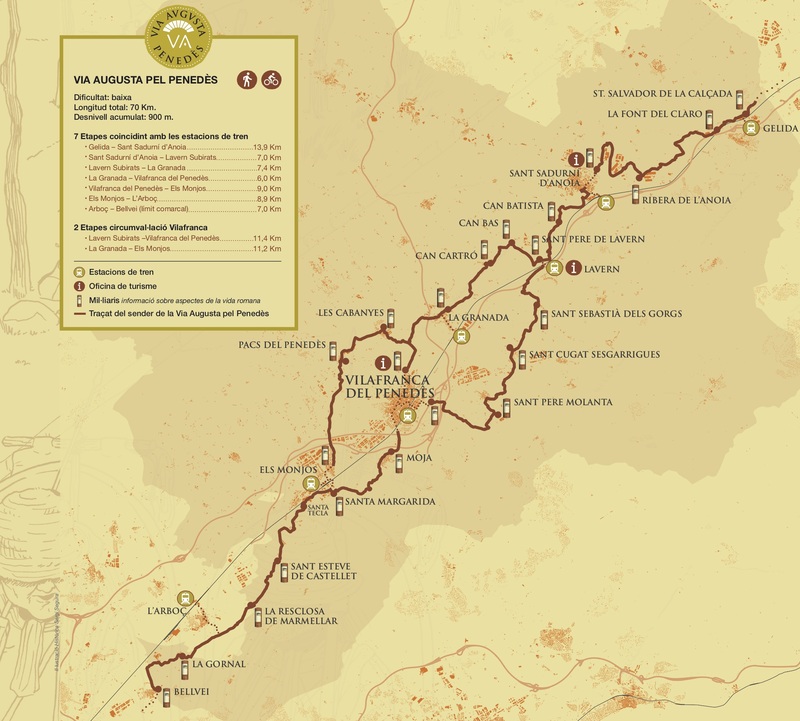 The Penedès has recreated the route of the Via Augusta as it ran through the county, to make it a way that allows one to discover the region as it is: a landscape full of paths, cattle crossings, and byways that make up a mosaic of vineyards that change colours with the seasons. The proposal is organized into 7 stages and 2 alternative routes that aren’t very difficult, from 6 to 12 km, which aren’t very steep. 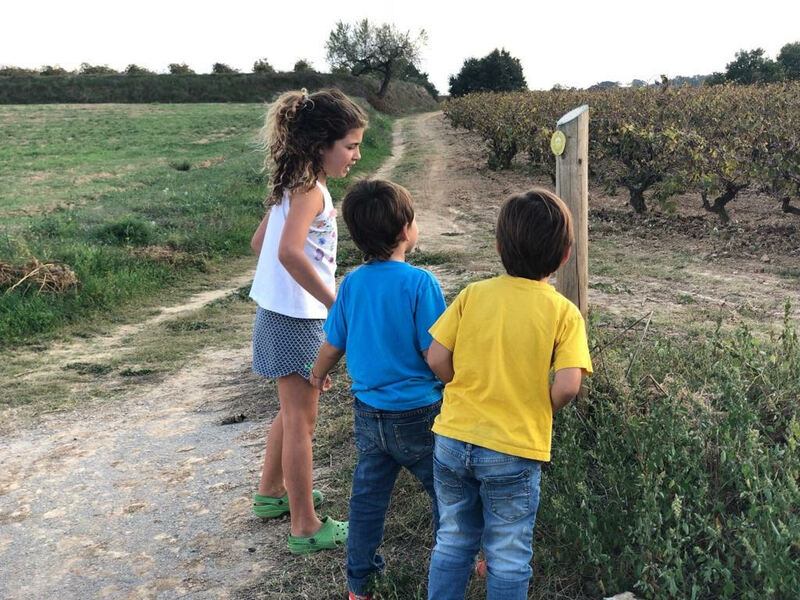 So this is a series of walks that can be made in either of the two directions, on foot or by bicycle, and which, together, allow one to go all along the length of the central backbone of Penedès County. There are two alternatives to the main route. One variant goes around the county capital by way of Pacs del Penedès to Santa Margarida i els Monjos, and the other arrives in Vilafranca from Lavern-Subirats by way of Sant Sebastià dels Gorgs, Sant Cugat Sesgarrigues, and Sant Pere Molanta. Distance: 51.25 km (without connections to train stations). Distance by the northern variant: 55.03 km. Distance by the southern variant: 52.4 km. Time on foot: 12 hours, 20 min. Difficulty: the difficulty of each stage ranges from easy to moderate. Download the full gpx track. Download the full gpx tacke (southern variant). Download the full gpx track (northern variant). Discover all of the stages. The growing of grapes in the Penedès dates back to before the 4th century BCE. Since then, the land has changed a great deal: there are new urban centres, routes for communication, industry, urban development... Even so, vineyards continue to dominate the landscape of the Penedès, a landscape that is worth discovering through the wide range of singular routes that allow visitors to get to know this land, whether on foot, by car, or by bicycle, enjoying the stories, the little corners, and the secrets of the Penedès.